The tighthead prop suffered ankle ligament damage in his side’s win over Edinburgh. Ulster duo Marty Moore and Jacob Stockdale. ULSTER TIGHTHEAD PROP Marty Moore has a suffered season-ending ankle ligament injury, the club has confirmed. Moore sustained the injury during the province’s impressive win over Edinburgh on Friday, which ensured they will have home advantage in the Guinness Pro14 quarter-finals. Moore was substituted after 10 minutes of the game with the ankle problem, and is now expected to see a specialist later this week. In addition to missing the remainder of Ulster’s season, this is a huge blow for the 27-year-old’s hopes of making Ireland’s World Cup squad. Moore failed to get the nod for the Six Nations this year but previously indicated a desire to return to the national squad. Meanwhile, Jacob Stockdale suffered a hamstring injury during that 29-7 victory over Edinburgh. Ulster report that his recovery will be monitored on an ongoing basis ahead of their next Pro14 outing against Leinster before that home quarter-final against Connacht on the weekend of 3/4 May. Email “Ulster's Moore suffers season-ending injury while Stockdale to be monitored ahead of Pro14 quarter-final”. 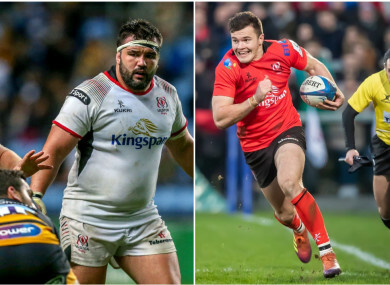 Feedback on “Ulster's Moore suffers season-ending injury while Stockdale to be monitored ahead of Pro14 quarter-final”.